The Island Lighthouse is the oldest landmark in Toronto. From its site on Gibraltar Point, it has watched most of Toronto's history unfold; its light beam has, for more than 150 years, been a welcome guide for the mariner into the Harbour of Toronto. There appears to be no direct evidence of the actual date when the Gibraltar Point Lighthouse was started but in 1808 the Upper Canada Gazette printed the following: "It is a pleasure to inform the public that the dangers to vessels navigating Lake Ontario will in a great measure be avoided by the erection of a lighthouse on Gibraltar Point which is to be completed in compliance with an address in the House of Assembly to the Lieutenant Governor." The address referred to above was dated March 9, 1808, and on April 6th the Lieutenant Governor visited the peninsula and chose a site for the lighthouse. The original structure was 16m high including a lantern and built of Queenstown stone. The building and its base, which is packed with stone to keep it in place, are hexagonal. The diameter of the base is 6.7m and the circumference is 20.7m. The walls at the base are 1.8m thick, gradually decreasing in size to 1.2m thick at the top. The structure was heightened by 3.6m in 1832 using Kingston stone. The total height of the stonework today is 19.5m the height from the stonework to vane is 5.5m and the overall height from ground to the vane of the lantern is 25m. The first light was a fixed white lamp that burned sperm oil. When the tower was raised in 1832, an improved white light was also installed and, after 1863, coal oil was used instead of sperm (about 900 gallons of oil were burned annually). In 1878, a new white revolving light was installed. This was one of the best and most powerful in North American waters. The light revolved once every minute and 48 seconds. The power to revolve the light itself was provided by simple and very efficient means. A cable with a heavy weight on one end was wound around a drum every 14 hours by the lighthouse keeper. The weight, travelling down a tower in the centre of the lighthouse, caused the cable to unwind which, being geared to a shaft, revolved the light. The light was projected by powerful reflectors. Also in 1878, the balcony around the lamp room, which was originally built with wood, was reconstructed using iron. This proved to be a very wise measure because the following year, the weather vane was reportedly struck by lightning which travelled down the walls, cleaning off all the whitewash and damaging the steps. In the winter of 1916-1917, the first electric light appeared. This was a fixed white light which flashed on and off. It had powerful reflectors and covered an angle of 240 degrees or more. In the spring of 1945, the present light was installed. A fixed green light is in use to distinguish it from the mass of white light emanating from the Island and the city beyond. 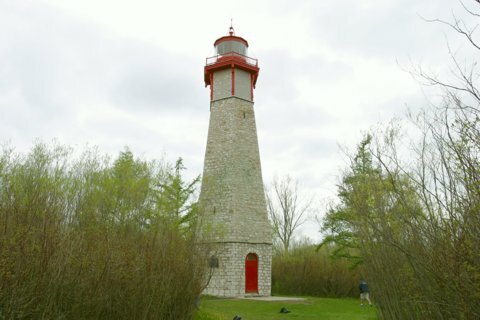 On May 23rd, 1958, the lighthouse was transferred to The Municipality of Metropolitan Toronto's Parks Department and was renovated during the Winter Works Incentive Program in 1961-1962. On January 1, 1998, Metro and the six municipalities within it were amalgamated into the new City of Toronto. It took us about 20 minutes to walk from the Hanlan's Point Ferry dock to the lighthouse. On the weekends the ferry runs once an hour so if all you planned to do was see the lighthouse, make sure you walk at a brisk pace so you can get from the dock to the lighthouse and back in time. In Toronto take Queens Quay W to Bay St.
At Bay St. turn right into the parking garage (not sure if it's a public or private garage). We had better like taking the subway. Get on the Yellow subway line and get off at Union Station. From there transfer to the red trolley cars, route 509 or 510. Get off at the Ferry Terminal stop. Exit the station to the street and you'll be at the intersection of Queens Quay and Bay St.
Once you're at the ferry terminal, take the ferry over to Hanlan's Point. When you get on the island it's about a mile walk to the lighthouse. Take the pathes that go to the left. At the ferry dock there's a map of the island where it points out where the lighthouse is. For a PDF map of the complete Toronto subway system Click here. For a PDF map of the downtown Toronto subway system click here.